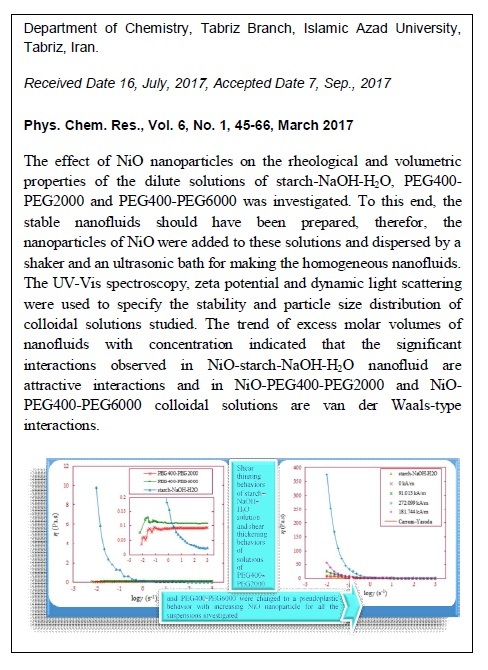 The effect of NiO nanoparticles on the rheological and volumetric properties of dilute solutions of starch-NaOH-H2O, PEG400-PEG2000 and PEG400-PEG6000 were investigated. Achieve this aim requires to prepare the stable nanofluids. Therefore, nanoparticles of NiO were added to these solutions and dispersed by a shaker and an ultrasonic bath for making the homogeneous nanofluids. The UV-Vis spectroscopy, zeta potential and dynamic light scattering have been used to specify the stability and particle size distribution of colloidal solutions studied. 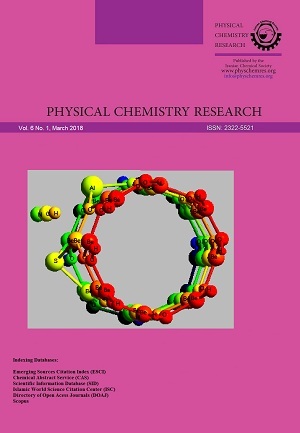 Fluid flow and suspense structure of NiO nanoparticles in the solutions of starch-NaOH-H2O, PEG400-PEG2000 and PEG400-PEG6000 were studied by measuring the magnetorheological properties at T=298.15 K. Bingham plastic, Herschel-Bulkley and Carreau-Yasuda models have been applied for modeling the magnetorheological properties of nanofluids. Density values of NiO-starch-NaOH-H2O, NiO-PEG400-PEG2000 and NiO-PEG400-PEG6000 nanofluids have also been measured at T = (298.15, 308.15 and 318.15) K. The excess molar volumes were calculated from the density data for highlighting the interparticle interactions occurred in nanofluids. Singh et al. equation was used for fitting the excess molar volume values.